It can be challenging to figure out how many shoes you'll need to take traveling with you. In general, the more practical the shoe the bulkier and heavier they are -- and unfortunately, there are so few multi-purpose options out there that you'll probably find yourself taking quite a few. In order to figure out which shoes will be best for you, start by working out what kind of trip you're going to be taking. If you're going to be spending the majority of your time in warm climates, flip-flops are fantastic for ease of use, weight, and size, as well for as being low value and easy to replace -- you won't be upset if somebody steals them or you lose them. If you're going to be spending a few weeks island hopping or enjoying beach destinations and don't plan on doing any kind of long-distance walking and hiking, or taking part in adventure sports, you won't need anything more than flip-flops. Just make sure you wear them in before you leave -- you don't want to end up with blisters between your toes and no replacement shoes. If you don't like wearing flip flops then an alternative could be lightweight sandals, such as those offered by Teva. You'll be able to walk around cities with reasonable support for your feet and ankles, as well as wander along beaches without a problem. You'll be able to take part in short one-day hikes wearing sandals, as they offer enough support to make this possible. If you're a runner and want to keep it up as you travel, it's worth taking your running shoes with you. You won't be comfortable trying to run in flip flops, sandals or hiking shoes, so take what you'll need. You could even pick up a cheap pair of lightweight running shoes before you leave so they'll take up less space in your backpack. Once more, make sure you wear them a few times before leaving to check they fit properly and won't cause blisters. If you're planning on doing any kind of hiking on your trip, then you should pick up some hiking boots before you leave. See if you can find a lightweight pair that isn't too bulky, as the size and weight of hiking boots are their main disadvantage. One way to get around this, however, is to always wear your hiking boots on your travel days -- while your feet will end up hot and sweaty, you won't be struggling to fit huge boots in your backpack. Vibrams are great for low-intensity exercise and they're a wonderful multi-purpose shoe. If you can get past the oddness of putting your toes in separate sections you'll find Vibrams to be fantastic for both support and your health. You can wear them when walking around cities, going for runs, hiking, and even going on the beach. In general, you do not need to take high heels with you unless you can justify carrying them. They take up a lot of space and you'll probably find that you hardly wear them. Flats are a much better option for evening shoes. If you want to dress up while traveling and won't feel comfortable wearing flip-flops or sandals to do so, then pick up a pair of flats to snazz up any outfit you're wearing. 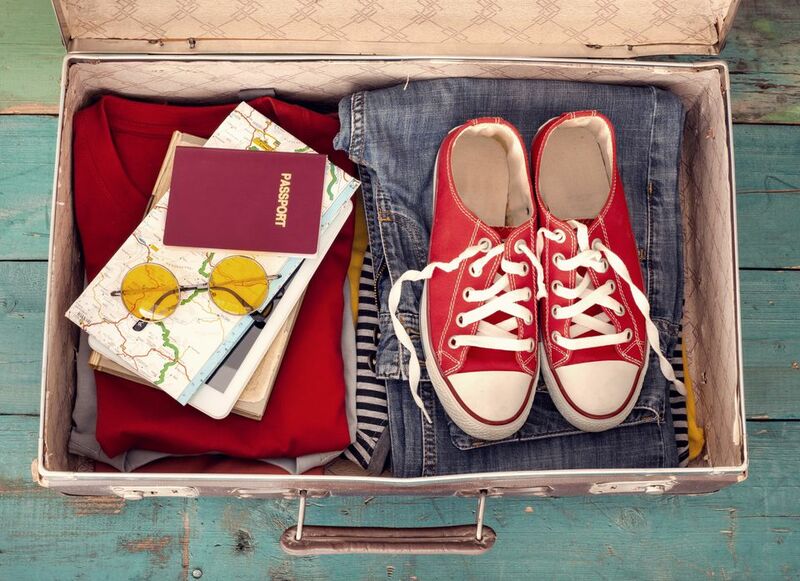 When it comes to shoes and travel, less is more. Take the bare minimum that you know you'll need and if it's not enough, buy some while you're out there. Are These The World's Most Comfortable Travel Sneakers?